My guide service includes the boat, fishing rods, reels, tackle, bait, plenty of fishing tips, life preservers, rain gear, and photos of your catch for up to five anglers per boat. For the ultimate in shore lunch experiences, our shore lunch now includes delicious Captain Ken Beans, GORP Bars and Lakemaid Beer for the adults! Shore Lunches are also available with the full day trips. I can arrange for large groups of up to 50 anglers with advance notice If you would like, I can also suggest lodging options for your trip. "The kids loved it, they had so much fun fishing"
The boat I use is perhaps the most roomy and versatile fishing machine on the market today. 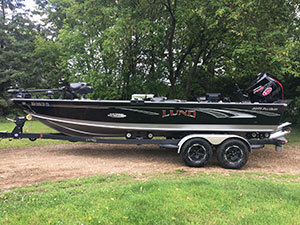 The boat is a 21' Lund Pro-Guide powered by reliable 200 h.p. Mercury Verado tiller drive outboard. The boat is loaded with all of the latest equipment such as 2 G.P.S. navigation units loaded with Lakemaster chips, a marine band radio for your safety, a cellular phone to keep in touch, multiple fish locators and graphs, dual trolling motors, and of course--6 swivel air-ride adjustable seats for your comfort. 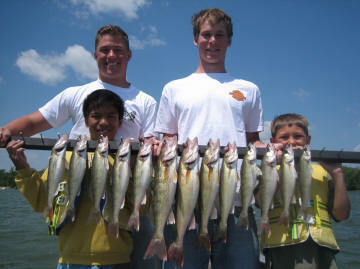 The boat comfortably fishes up to 5 anglers! Everybody that has fished in the boat has loved it! See our Ice Fishing page. "One of the best guide experiences I have ever had. We caught a ton of fish!"